"Imagine having the ability to produce the warmth of a candle, the pale blue of a moonlit night, or the brilliant white of a sunny day, all with a simple adjustment of a wall control, without color filters or lamp changes. This flexibility is delivered with the comfort of lighting without glare or harsh shadows." As its name implies, Postfossil is a firm dedicated to designing for the post-fossil-fuel future. This lamp, called "Goodnight Eileen", is an energy-efficient LED lamp that refers in its design to the old-fashioned, hand-held candle, used to guide someone through a home. It is recharged at its base, then keeps lit for a few minutes before slowly fading. "Electricity is transferred between the lamp and its base via magnetic induction, so there is no visible connection." More at the Postfossil website. Organic Light Sculptures are designed by Daniel Rossi in Brooklyn, NY using bamboo, energy-efficient LED lights, and other sustainable materials. Check out the collection here. Mr. Rossi constructs the lamps himself. There is a great video of him constructing one of his lamps on the website. Great to have so much information about how products are constructed. You can order them directly from him online, too. Hybrid lighting, currently available only for large-scale commercial buildings, is an exciting new technology that could greatly lower buildings' carbon emissions. Marilyn Brown, of the Georgia Institute of Technology, worked with scientists at the Oak Ridge National Laboratory to develop it. Marilyn Brown: "So you have roof mounted collectors that concentrate the sunlight into optical fibers. And these fibers carry the sunlight into the building, into light fixtures. These light fixtures also contain electric lamps. For instance, they may be combined with fluorescent tubes. So that, whether there is sunshine or not, the lighting in that room will be very bright and appealing." Sunlight Direct plans to start beta testing a residential model in 2008. Though a tiny amount of mercury is sealed into CFLs and is essential to their function, if disposed of properly, danger can be avoided. The Association of Lighting and Mercury Recyclers has a helpful page providing the facts and urging us to lobby retailers to provide CFL recycling bins so that these bulbs can be easily disposed of. "The head of the Environmental Protection Agency program concedes that not enough has been done to urge people to recycle CFL bulbs....'I share your frustration that there isn't a national infrastructure for the proper recycling of this product,' says Wendy Reed, who manages EPA's Energy Star program. That programs gives the compact bulbs its 'energy star' seal of approval. She says that even though fluorescent bulbs contain mercury, using them contributes less mercury to the environment than using regular incandescent bulbs. That's because they use less electricity — and coal-fired power plants are the biggest source of mercury emissions in the air. 'The compact fluorescent light bulb is a product people can use to positively influence the environment to… prevent mercury emissions as well as greenhouse gas emissions. And it's something that we can do now — and it's extremely important that we do do it,' Reed says. 'And the positive message is, if you recycle them, if you dispose of them properly, then they're doing a world of good. 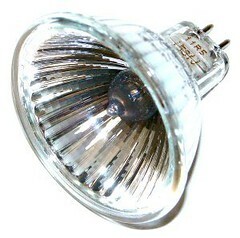 'Reed says the agency has been urging stores that sell the bulbs to help recycle them. 'EPA is actively engaged with trying to find a solution that works for these retailers around recycling the product, because it's really, really important,' Reed says." cars off the roads. That's the law of large numbers--a small action, multiplied by 110 million." MR16 lamps are used a lot in commercial display and restaurant lighting, and in some residential apps. MR16’s look like little car headlights, and are about two inches in diameter. Sylvania makes the same thing: the Tru-Aim IR, and you can save money and energy by substituting a standard 50watt MR16 with a 37watt Tru-Aim IR to get about the same luminous intensity. The IR lamps cost a few bucks more each, but the gain in efficiency is considerable: 35 – 40%! Many suppliers and electricians are unaware of this product, so special order them, or get them at Lightology or other lighting suppliers. Anyway, my goal is to design a hybrid system using a modestly priced track and integrate the Ew MR lamps with that when they are available. I did purchase a nice bendable monorail LINE voltage track from ConTech, with heads that accept LINE voltage MR 16’s. But the Ew MR are 12 volt, and require an integral transformer. Should I have bought a 12 volt monorail now, with 12 volt MR 16’s, to more easily switch out to the Ew MR which are also 12 volt? Are we all confused yet?? Not to worry. I have it all figured out, and will float one or two Ew MR’s on my track on fixtures that have integral transformers. Can’t afford much more than that, as they cost about 100 bucks each! NOT TO WORRY. They will drop in price soon. But I can’t wait to be the first one on the block with my very own (soon to be very, very green when the price drops) Ew MR fixture!